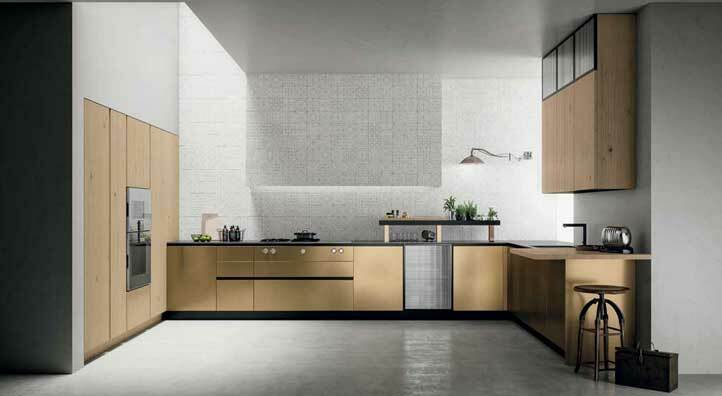 SoHo is a kitchen with an industrial style, inspired by factories transformed into apartments, filled with steel, wired glass, metal and metal-effect lacquer finishes. 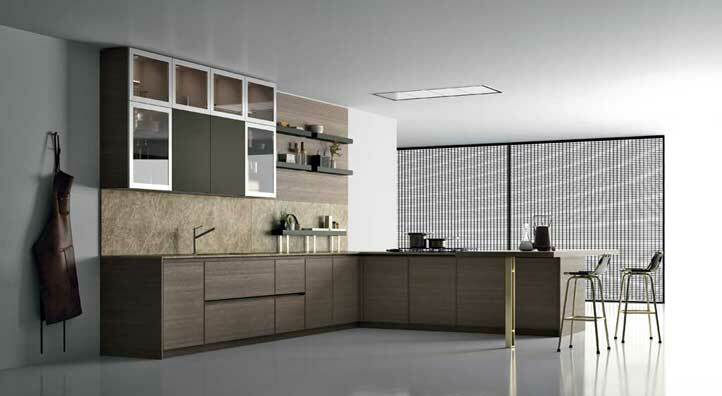 Domestic warmth is introduced by no less than five chestnut finishes and attentive details. 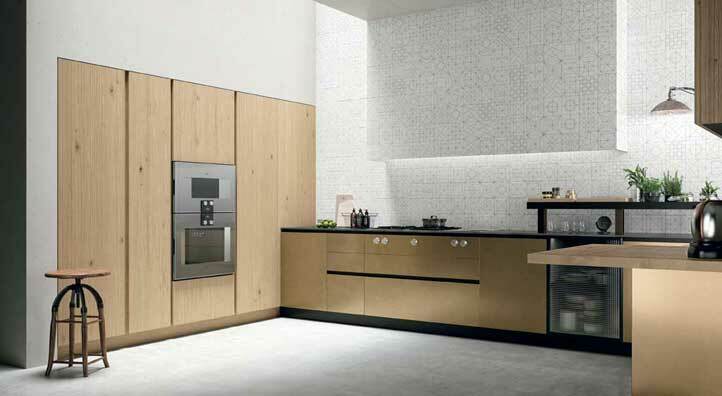 They include a unique profile frame cabinet door that brings a soft touch, a projecting edge profile and countertop trays that bring movement to SoHo’s sedate qualities. 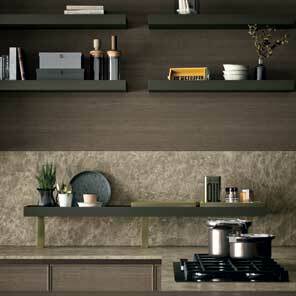 Another of SoHo’s characteristic is its black metal bookshelf which make an ideal divider. 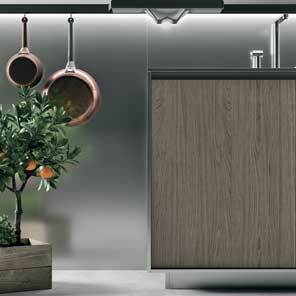 SoHo is a modular kitchen that matches the style of its users. 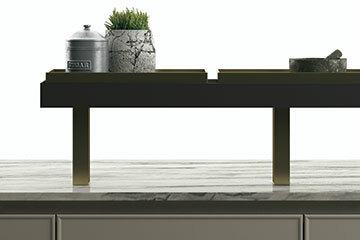 Here it features an island in marble and stained oak. This elegant and sophisticated version is updated by a touch of brass, wall mounted trays and cabinet fronts with polished stainless steel frames. 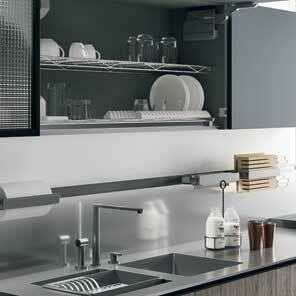 SoHo countertop trays are also available in wall mounted versions. 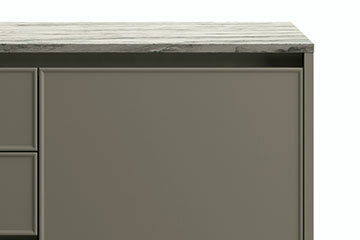 Designed specifically for SoHo with a soft and only slightly raised edge that frames the cabinet front. 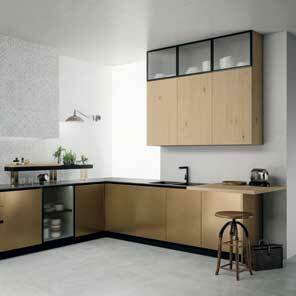 Cabinet fronts with polished stainless steel frames and transparent bronze glass bring a modern twist to the wall units. 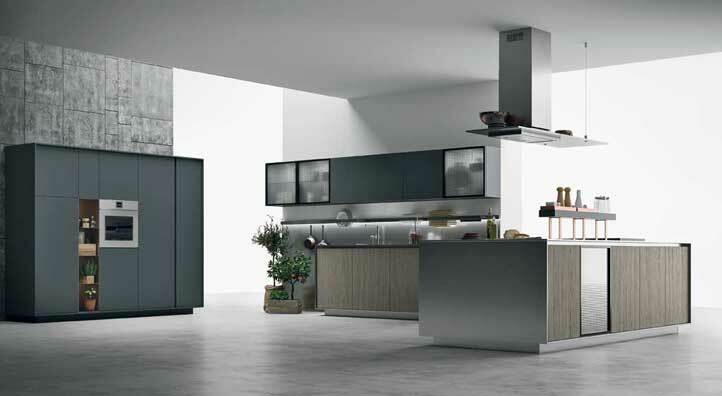 SoHo is a modern modular kitchen with unique solutions designed to ensure a linear and sophisticated look. One of these is the projecting edge profile of the base and tall cabinets. 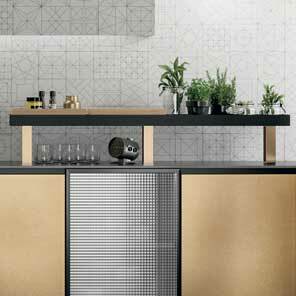 The profile delineates a minimal frame created by projecting the end panels, bottom and countertop edges to frame the cabinet fronts.. 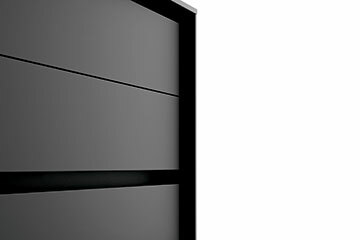 Designed exclusively for SoHo, the profile frame cabinet front features a soft and only slightly raised edge, a discrete decoration framing the entire front. 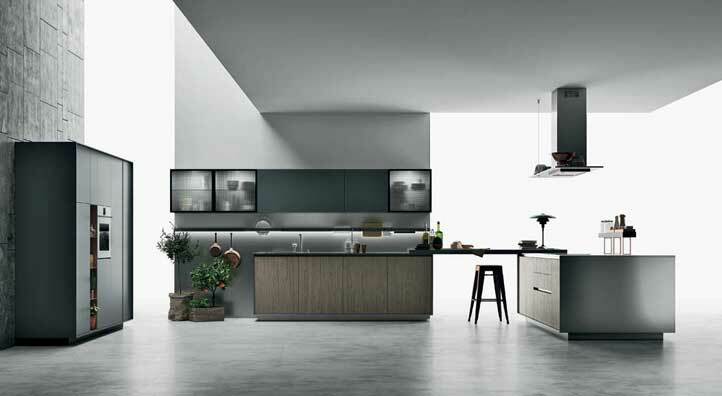 To heighten its modern and clean style, SoHo is completed by a groove handle system that creates the appearance of a kitchen without handles. The industrial flavour of this collection continues with countertop trays designed to ensure that condiments, spices and everything else one needs in the kitchen are always close at hand. Custom designed in modular lengths, they consist of metal trays and countertop mounted supports. SoHo’s bookshelf is perfect for fitting out a kitchen and living room as a unique environment because it separates functions without interrupting views. 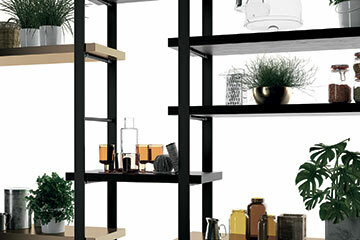 It features a modular structure in black metal and shelves in different finishes. It is available in a wall mounted or floor to ceiling model. SoHo is also surprising in its “industrial kitchen” version. Ample spaces, a spacious pantry and sizeable tall cabinets designed to contain extra large American appliances, similar to industrial New York lofts. All with a touch of the unique in refined ottone finish. 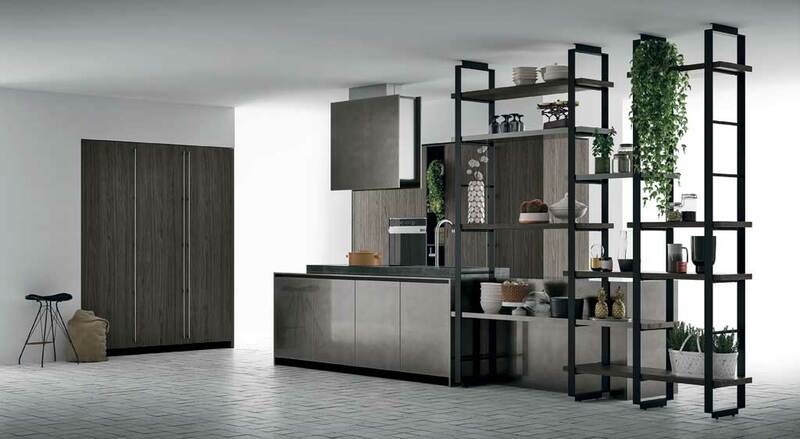 SoHo is a modular kitchen with extra large 76 cm wide tall cabinets. 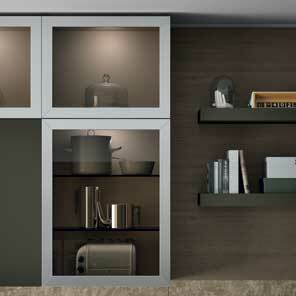 Cabinet fronts with black aluminium frames and wired glass interrupt the uniform appearance of the base and wall units. 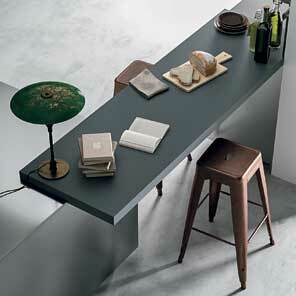 The base units shine: in finely hand scratched ottone lacquer. 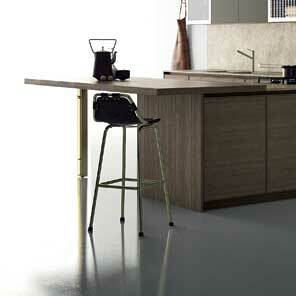 This version of SoHo creates a modern kitchen with an industrial style. The typical steel of professional kitchens is used for the countertops of base and island units, as well as the end panels and exhaust hood. 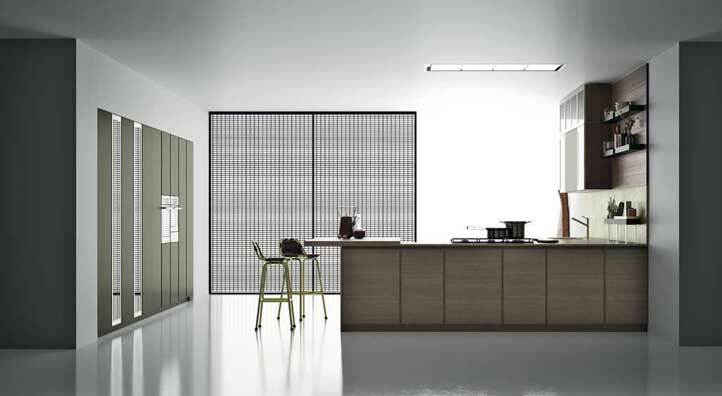 Fenix NTM®, soft to the touch and highly resistant, wraps the tall and wall units and the snack counter. 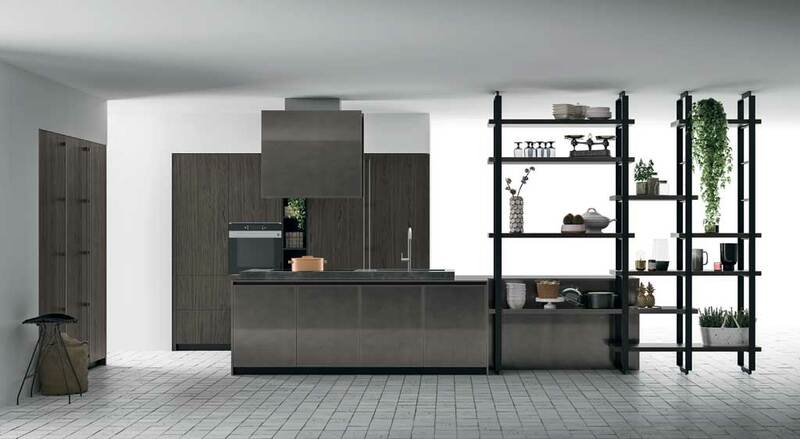 The snack counter in Fenix NTM® links the wash up zone with the cooking area. It creates a highly effective relief line: a frame around the edge of the cabinetry defined by the most minimal projection from the cabinet face. 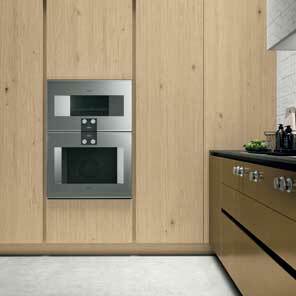 Motorised flap fronts simply life in the kitchen: they lift up at the push of a button.